To determine long term survival among women treated for cervical cancer and to provide long-term information regarding mortality and morbidity following treatment. 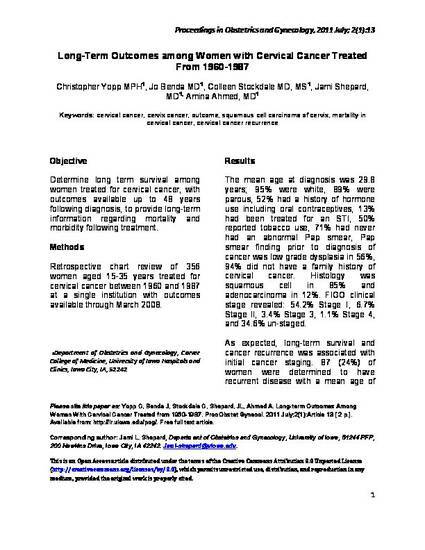 Among a cohort of young women treated for cervical cancer over a 27 year period, with survival available up to 48 years from initial diagnosis, there were no variables identified which impacted the duration of survival beyond the initial stage of cervical cancer at presentation. Copyright © Christopher Yopp, Jo Benda, Colleen Stockdale, Jami L. Shepard, and Amina Ahmed, 2011.